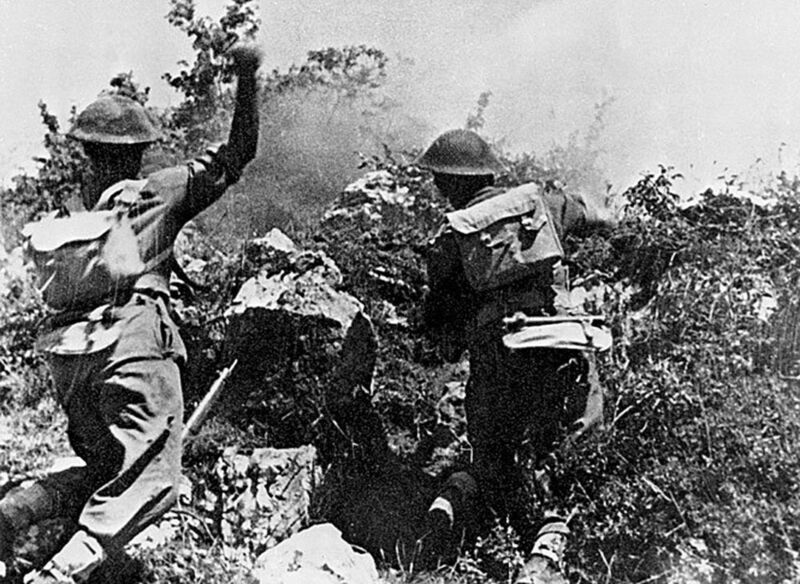 May 18th next year marks the 70th anniversary of the victory of the famous battle at the Monastery of Monte Cassino in Southern Italy in 1944. This highly significant battle was one of the most important Allied victories of the war, and had by then been raging for nearly six months. Its capture from the German Army had required four separate hard fought bloody battles involving Allied soldiers from Britain, America, Canada, France, Morocco, India, Poland, and New Zealand. However, its success and significance were largely overshadowed early the following month by the D-Day landings in Normandy which signaled the beginning of the end of WWII. For the Poles it represented the pinnacle of their wartime achievements. In the battle, members of the celebrated Polish 2nd Corps led the final successful assault and capture of the mountain top monastery. How proud it was for them - in the eyes of the world - to raise the red and white Polish flag above the captured ruins. For most of the Polish soldiers who participated it was their first combat involvement since their homeland was invaded by Germany nearly five years earlier on the first day of September 1939. But who were those Polish soldiers at Monte Cassino? Why were they there in Southern Italy? Where had they come from? How had they arrived there? And most importantly, why were they even bothered about fighting at all? Most of the Poles there had originated from the eastern borderland region of Poland known as Kresy and theirs is the tragic and truly unbelievable story of the short lived 2nd Polish Army Corps. Born in Russia's frozen steppes from the emaciated remnants of a Polish nation exiled to Stalin's labor camps in Siberia, who against all odds and despite unimaginable hardships, murder, intrigue, conspiracy, international betrayal, mystery and controversy, they developed into an elite fighting force in a hopeless struggle to liberate a homeland that would never be free. Theirs is a story that occurred during a largely unknown and poorly documented period of modern history that has been denied by successive Russian Administrations and overlooked by Western governments and media: a story hidden from most in the West. But it is a story with long lasting ramifications - a story that continues to the present day. Even before the victory at Monte Cassino, the allies, who had gone to war in Poland’s defense, had abandoned her to Stalin’s demands for the Kresy region to be permanently incorporated into the Soviet Union. For the disillusioned Polish soldiers there was no recognizable country of their own left that they felt able to accept. They knew that they could never return to their homes or the families they had left behind ever again. For most of the Poles at the battle of Monte Cassino it was just the next phase in a long battle that had started in late 1939 at the start of the war. At that time, over a million Polish citizens were deported, not by German, but by advancing Russian troops. They had battled starvation and brutality just to stay alive, in prisons, in cramped cattle trucks, in the bowels of murderous ‘Slave ships’ and in Soviet hard labor camps: the dreaded Gulags. They received an unlikely “amnesty” in 1941 when Germany invaded Russia and Stalin was desperate for anybody to help him fight against Hitler’s mechanized war machine. On release they had to find their way to recruiting centers in an attempt to join a Polish Army being created by the charismatic General Wladyslaw Anders. They moved through Russia, Kazakhstan, Uzbekistan and Turkmenistan, and for those lucky enough, onto Iran, Iraq, Jordan, Palestine, Egypt, and eventually to Italy. Once there, loyal to the Polish Government-in-Exile in London, they fought without fear in battles against the German Army - hoping to in vain for the opportunity to liberate Poland. Success on the battlefield was tempered by catastrophes on the political field. The already strained Polish relationship with Russia moved to breaking point in 1943 when the bodies of thousands of military officers, academics, politicians, and doctors murdered in 1940 were discovered at Katyn near Smolensk. General Sikorski, leader of the Polish Government-in-Exile, demanded an immediate independent investigation. Stalin was incensed and severed all diplomatic relations. Within weeks Sikorski had died in a mysterious plane crash and as Stalin’s Red Army grew stronger and pushed further west towards Berlin he demanded acknowledgement from the allies for his puppet Polish Government. The allies needed Stalin and distanced themselves from the Polish Government-in-Exile, and so the fate of the Polish 2nd Corps was sealed. For most, like General Anders, the man who was arguably the savior of the exiled Poles and millions of other Poles around the world, the fight to see a free Poland has never been won. Many, including Anders, died in exile never returning to see the country of their birth. The Poland that they knew and fought so long and hard for would never return. Even now, with Poland fully integrated into the European Union, the pre-war Polish Kresy region, lost to the Russians in September 1939, is now part of Belarus and Ukraine. Sanctuary was reluctantly offered by Britain and as the Polish 2nd Corps was disbanded the soldiers moved through the Polish Resettlement Corps to new lives in England, Canada, New Zealand, and Australia where known as Polonia they still maintain strong Polish communities. Even the memory of the Polish 2nd Corps is kept alive with active ex-combatants groups and the name of Anders and the Polish 2nd Corps, once ridiculed and denounced in Communist Poland, has at last been recognized and honored. It is now quite rightly remembered with pride for their place in modern Polish history. The father of author Frank Pleszak was deported to Siberia aged 19 and Frank has had the story of his journey published by Amberley entitled “Two years in a Gulag”. Frank is also finalizing a book on the concise history of the Polish 2nd Corps for publication next year and is a contributor to the Kresy-Siberia Virtual Museum. And what happened once the Soviets dominated Eastern Europe? Click here to read about escaping Poland’s neighbor, Czechoslovakia, with the ‘freedom tank’.